In five days the throngs will again descend on the nation’s capital and gather in state capitals across the land. They will come together peacefully, for the 42nd year in a row, to mourn the deaths of countless millions of preborn babies. 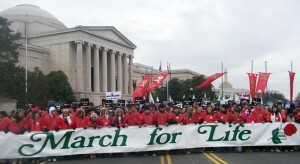 The March for Life is upon us. Nobody knows for sure how many children have been returned to God by surgical, chemical, and clinical acts of murder and mayhem, but die they did. And so we say to our lawmakers and among ourselves that this is the year victory will be achieved. But after 42 years, perhaps we should examine why we continually say that every year, and what we will do differently to avoid another tragic memorialization of preborn babies in 2016. We know from past experience that, even with an alleged pro-life majority in both houses of Congress, the best we can hope to achieve is the defunding of Planned Parenthood—a victory that, even with an Obama veto, might squeak by and make it into the law books. A long shot maybe, but we will accept the odds. Will that crippling of the abortion giant end all child killing prior to birth? No, but it will send a signal that pro-life Americans are serious—very serious—about taking Planned Parenthood off the federal dole and beginning to turn the tide back to respect for the sanctity of every innocent human being at every stage of his life. The next thing we can do differently is focus more attention in a unified way on teaching the young and the ignorant about the simple facts of life. For example, a pregnancy is not a disease; it is a blessing—even when accompanied by trepidation, fear, and loneliness. This is why we need to quadruple the number of pro-life pregnancy care centers in America. The pro-abortion, culture of death movement recognizes how effective these centers are. Just think about the collusion between Maryland state officials and NARAL designed to shut down pro-life pregnancy centers. These centers save mothers and babies from the acts of abortionists, so let’s open more. With an increasing number of centers, we will see more babies saved and more lives turned around by love, compassion, and concrete assistance. Finally, we need to think about the future—a future that will be fashioned by the young who are now in grade school, high school, and college. Their world is a whole lot different than my generation. When I started fighting against abortion in 1969 we did not Tweet, Facebook, or e-mail. We walked the streets, we made phone calls, and we sent letters with postage stamps on them. We went door to door, educating and being offended by nasty looks, words, and actions. In that sense, the fact that people are angered by our defense of the innocent has not changed, though the tactics of such folks have. No matter what the era, however, our arguments were the same as they are today: A human being prior to birth is a member of the human family and we are obligated to defend and protect him no matter what the cost. This is a lesson we can easily teach and repeat to young people even as young as preschool. Education and inspiration go hand in hand, and today there are so many tools at our disposal that changing hearts and minds is possible in ways we never could have previously imagined. By the same token, teaching the young the truths we know are inviolable is not all that difficult. In this great endeavor to create a new culture of life we are inspired and sustained by the confidence that comes from knowing that the Gospel of life, like the kingdom of God itself, is growing and producing abundant fruit (cf. Mk 4:26-29). There is certainly an enormous disparity between the powerful resources available to the forces promoting the “culture of death” and the means at the disposal of those working for a “culture of life and love.” But we know that we can rely on the help of God, for whom nothing is impossible (cf. Mt 19:26). 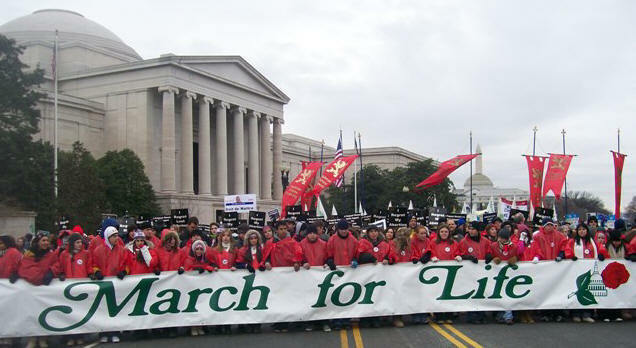 American Life League will have a booth at the March for Life Expo at the Renaissance Hotel on Wednesday, January 21, and Thursday, January 22. Stop by booths 409 and 411 for fun giveaways, photo ops, and important information. We will be at the March. Where will you be? Once again it’s almost January 22, and once again we will converge by the busloads on the Mall, to stand in the mud and wind and listen to politicians and celebrities tell us how invincible we are, and one again we will walk as one huge mass up to the Capitol and the House and Senate buildings – and right past their doors to the buses and subway. We will ride home, congratulating ourselves on the turnout and the message we sent, on how “WE showed ’em!” and on how they’ll be overwhelmed by our numbers. And, inside those Senate and House office buildings, the corridors will remain silent and uncrowded, and offices that do not have windows overlooking the March will never know we came. It’s too easy for legislators and their staff to deny our numbers and turnout, if they simply stay indoors at lunch and leave work after the crowd’s gone. In the early days of the March, more emphasis was placed on lobbying. We need to get back to that. Go to the offices before the rally. Go afterwards, before the bus pulls out. Budget the time. Have bus captains or representatives from each group drop by a Congressional office and at least one Senate one with a list of the people who came from their state. Ask for a meeting. Make the corridors buzz. Havevolunteers outside the buildings steering people to ALL the doors to keep things moving, collecting signs and trash and loading it into pickup beds. We need to recapture the excitement and the energy, to shake things up, to give the youngsters a sense of purpose and a lesson in grassroots civics. See you tomorrow – inside!